NAGOYA - Japan's first test of a remote-controlled driverless vehicle on a public road was held Thursday in Aichi Prefecture, home to Toyota Motor Corp. and other auto companies. 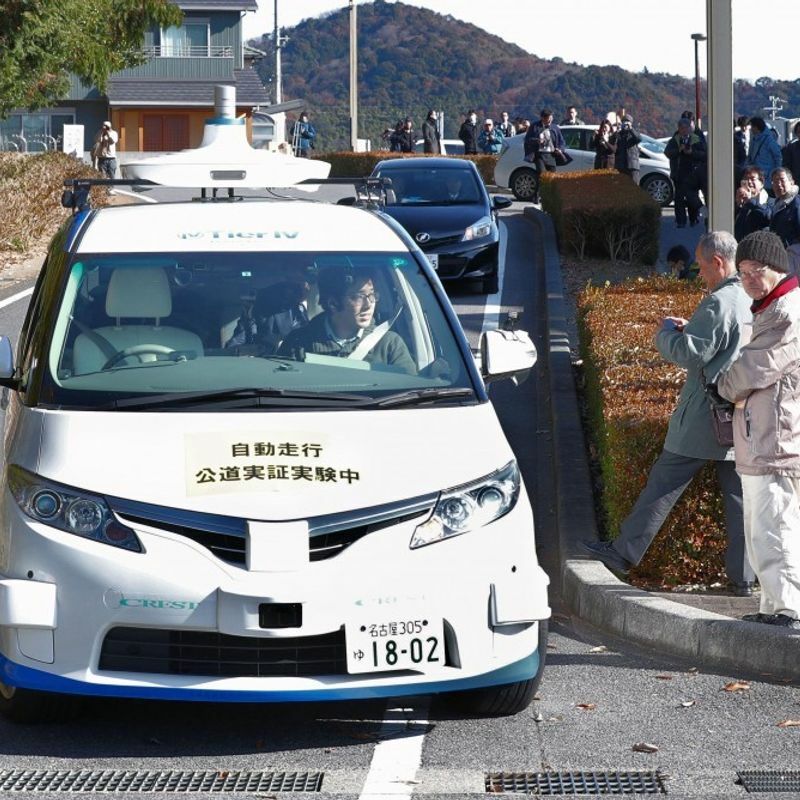 In the test conducted by the central Japan prefectural government from around 10 a.m., the driverless minivan traveled along a road in the town of Kota. It had previously memorized the 700-meter-long route and traffic signs along the way. With its onboard cameras and radar monitoring the road for vehicles and pedestrians, the minivan briefly stopped at a crossing where reporters and photographers had gathered, before continuing along the route at under 15 kilometers per hour. 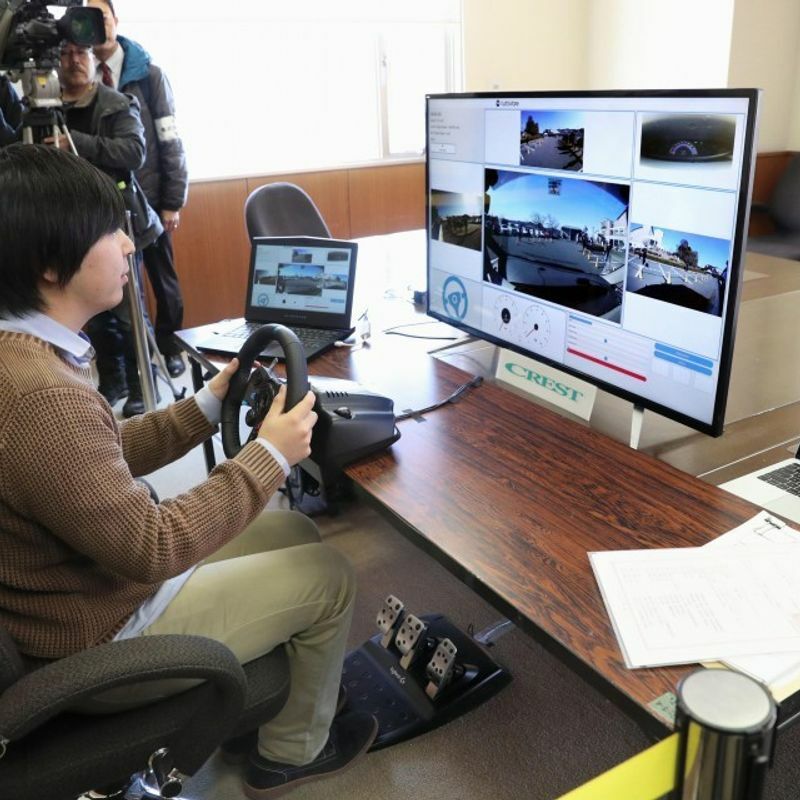 A member of the test team operated the minivan remotely from the Kota community hall near the test course, monitoring footage transmitted by the onboard camera, while an assistant in the passenger seat was on hand to stop the car in case of emergency. Aichi Gov. Hideaki Omura said after taking a test ride, "The steering wheel rotated very smoothly. I felt like I was experiencing the technology of the near future." The prefectural government aims to promote development of autonomous driving vehicles by Aichi-based auto industry firms and plans more tests by March in Nagoya and other locations. It expects that technological developments will lead to the introduction of driverless taxis in the future. In Tokyo, start-up ZMP Inc. also conducted Thursday a driverless car test on a public road in Koto Ward with the remote-controlled vehicle driving for 150 meters at speeds of up to 20 kph. 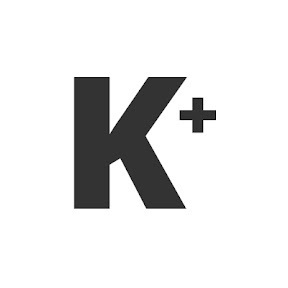 The company will hold another test on Dec. 23, which will be open to the public. The driverless car tests on public roads became possible after the National Police Agency revised traffic rules in June.